The key to Candor Charter success as a family company is a strong dedication of motivated professionals. The team is actively focusing energy on customer experience for their 14 sailing yachts based in Marina Kaštela, Croatia. The idea of starting a business came to Ferenc Szor in 2004, when he was about to buy his first sailing boat in Croatia. As an experienced Hungarian sailor, he has recognized the need for a reliable and flexible partner who would be a perfect choice both for his fellow yacht owners and the sailing community in general. It took him only a few weeks from the idea to developing a business model that resulted in establishing Candor Charter fleet. Back in 2005, Candor Charter started operating with only two sailing boats. The initial goal had been to serve Hungarian market needs, but when Gabor Szor brother of Ferenc joined the team, this scope was broadened to the international charter market. Gabor started to work as managing director of the company in 2007 and soon his wife Ari also joined the team. The fleet has been growing gradually ever since reaching 14 sailing yachts all based in Marina Kaštela, while at the same time keeping the quality of service high. The team has been working together for 12 years and their happy family spirit is very well recognized by the customers. As they like to highlight: "Team members are not the employees of the company, the team is the company!" Dedicated local service staff that maintains the fleet during the entire year is perfectly familiar with the sailing area and their knowledge is a great resource to any guest on sailing holiday. Candor Charter fleet concept is to focus on the expectations of the clients. In Marina Kaštela, they offer well equipped, premium models from French shipyards Jeanneau and Dufour, as well as some more affordable yachts which makes them an excellent choice for every budget. Candor Charter team is constantly doing their best with the guests and with business partners, always keeping in mind the true meaning of company name "Candor" - the quality of being open and honest. Like every small start-up company, Candor Charter has started its business organization using a piece of paper and later upgrading to an Excel spreadsheets. Over time they have tried many different tools to publish availability and manage bookings, with the intention to speed up the workflow and improve sales performance. The same problem always stayed, information had to be entered manually in multiple places after which partners and clients still didn't have a possibility to book the fleet in real time. To solve this problem they have decided to find a booking system that is solid, safe and flexible and very quickly recognized Booking Manager System as the best possible solution for their business. 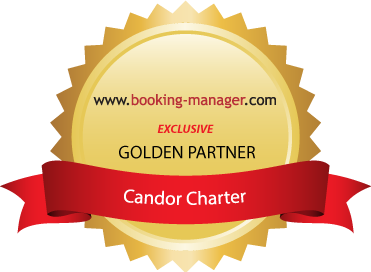 As a Booking Manager Golden Partner, Candor Charter is enjoying the full benefits of exclusively using the System such as lower operational costs and additional booking security. By providing the integrated back office tools to increase productivity and largest worldwide sales channel to improve the position on the market all in one place, Booking Manager System helps Candor Charter in accomplishing their main goal - to be a trustworthy company that partners and guests can count on. For more information visit www.candor.hu website.